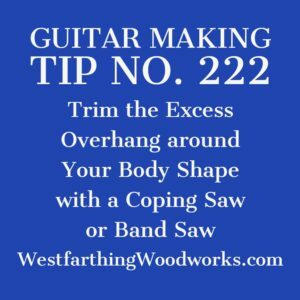 Guitar Making Tip Number 222 is about trimming your top and back plates. In order to make your arch, the plate needs to flex. Getting rid of the excess will help, and thankfully it’s an easy process with power or by hand. Most guitar plates are at least somewhat arched. The top plate has a slight dome and the black plate has a little more pronounced dome. This is done by altering the internal braces before they are glued. The bottoms of the braces are sanded or planed to have an arch, and then they are glued to the plates. The thin plate flexes to match the curve of the braces, and you have an arch. After you draw out your guitar shape, there will be a lot of wood that is outside those lines. 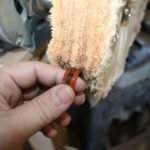 You need to remove that wood, and it will allow the plate to flex better. 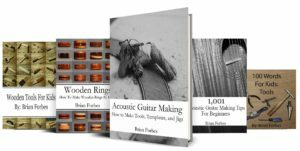 If you are making a custom guitar, my 25 Simple Ways to Customize Your Guitar Without Altering the Tone is a helpful post. 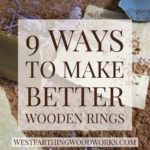 The excess around the outsides of the plates causes problems sometimes because it is just more wood that needs to bend. The doming shape is already a little restricting on the wood pieces, so the less you have in the way the better. Removing the excess is easy, just make sure that you leave yourself some margin so that you can make adjustments when you attach the plates to the sides. The last thing you want is to come up short. A band saw or a coping saw are the perfect tools for removing the excess, and the only difference is how long it will take. If you have a band saw, that is the tool I recommend, because the process will be really quick. Mark out our final size on the top and back plates, and then give yourself at least half an inch of margin all the way around. At the top and bottom of the back plate, you can use more like an inch, because bending the back plate will eat up some length. Use the saw of your choice and cut away the excess material. Be careful when making this cut, because the flexible plate will lift to bend. If you catch it on the saw, it can crack. 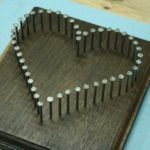 This is more likely on the coping saw, but you can minimize it if you make the cutting stroke the down stroke, because they table will absorb the energy. 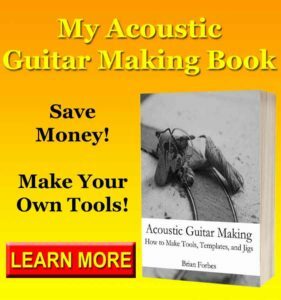 For more tips, my 25 Guitar Making Tips for Beginners is a good read that can help you make better guitars. Your homework is to trim your plate excess the next time you dome your top. Do this before you glue down the braces, and the top plate will flex better. It’s a simple change in your building process, but it makes the top bend better. The back plate really benefits from this process, because if you want, you can put a stronger bend in place. I really like the look of a heavily domed back plate, and on a lot of my guitars, I really bend the plate to give it a strong look. After trimming the excess wood with a saw, start gluing your braces. 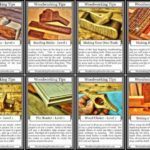 The pieces will go on easier, and the plates will bend easier. See if you like the new method, and if you do, you can keep doing it as you build more guitars. The top and back plate are domed, and this is a common feature in most guitars. The plate are stronger, and the arching process is pretty easy. If you trim the excess on your top and back plate, you can make it even easier. 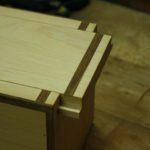 Use a band saw or a coping saw to trim the excess. Mark out your final size, and then around half an inch of margin to make sure that you still have some wiggle room. On your back plate, give a little more space at the top and bottom of the guitar. Now, trim the plate excess to the margin line, which leaves you some material to make adjustments later as needed. Trim carefully, because the plates are thin. A good catch, and you can lift the plate, causing a crack. Work carefully and slowly. If you have any questions about Guitar Making Tip No. 222, please leave a comment and I will be glad to answer them. Also, please Subscribe so that you don’t miss out on anything new. Happy building.